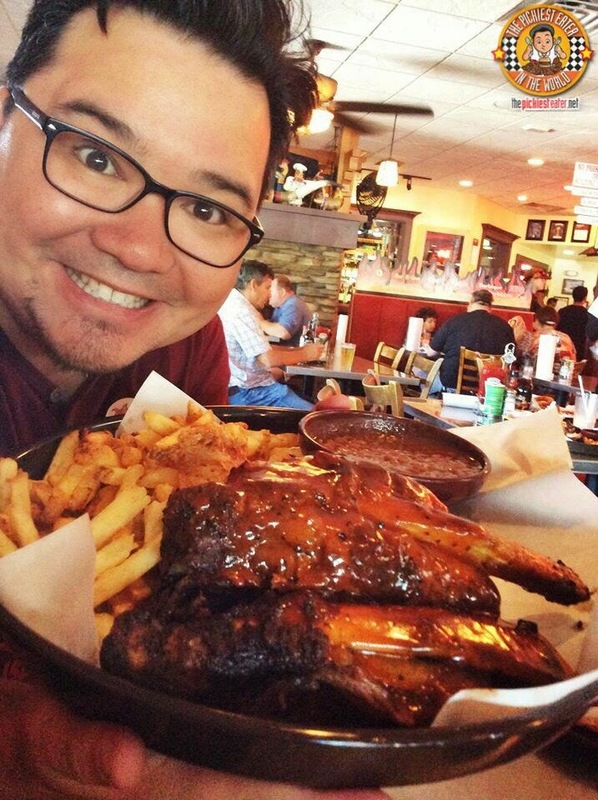 THE PICKIEST EATER IN THE WORLD: PHIL'S BBQ SAN DIEGO: CHECK ONE OFF MY MVF BUCKET LIST! Cara warned me that Phil's BBQ is one of the busiest restaurants in San Diego during meal hours, so it would be best to go a little after lunch. Much to our surprise, there was a line that nearly reached the outside door, despite the fact that we got there at around 2pm. The exterior of Phil's looks like a huge barn you would see out in the country, and the rustic, "homey" interiors emanate inside as well. Though the dining area is pretty huge, it does get packed, so if you plan to eat their during the height of lunch or dinner, expect to be seated in the Al Fresco areas. (Which isn't so bad considering its in San Diego.. not The Philippines). 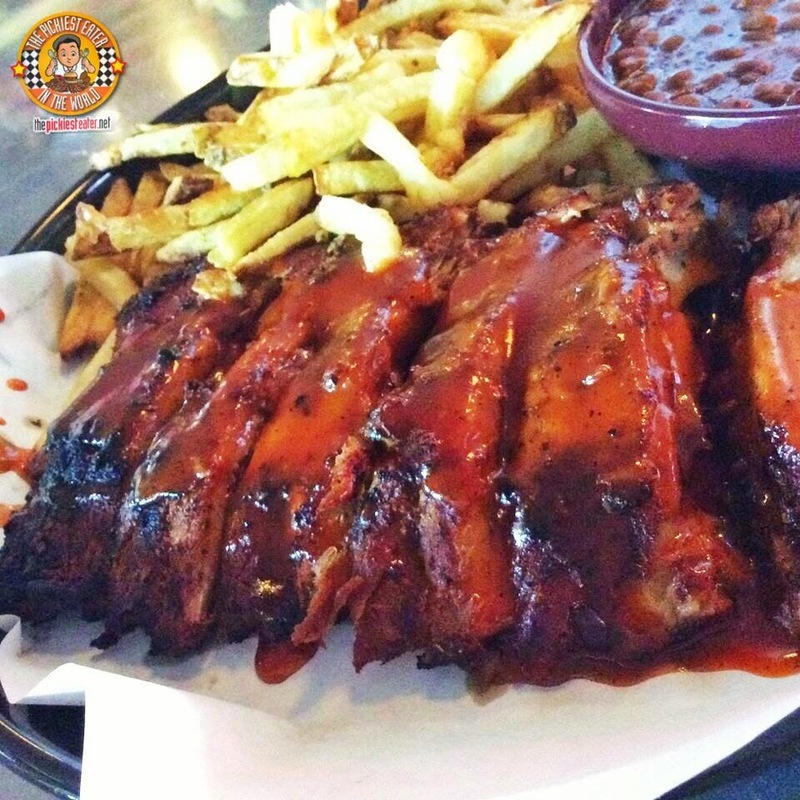 Phil's BBQ offers a "Fast Casual" style of service.. Meaning you line up at the counter and wait for your order to be served to you. Every step I took closer to the counter got my tummy grumbling louder and louder, making my mother think there was thunder outside. Drinks are self serve, whcih worked out perfectly for my brother, who's main goal when visiting the United States was to try practically every sugary drink known to man. Once again, I would like to apologize for the quality of the pictures. I decided against bringing the DSLR, and I decided to leave my wife's point at shoot at home, for fear of losing it (The one time I brought it out of the house, I lost it). Our meal began with the Colossal Onion Rings (US$ 3.95/US$ 6.95), perhaps one of the juiciest, tastiest onion rings you will ever try. 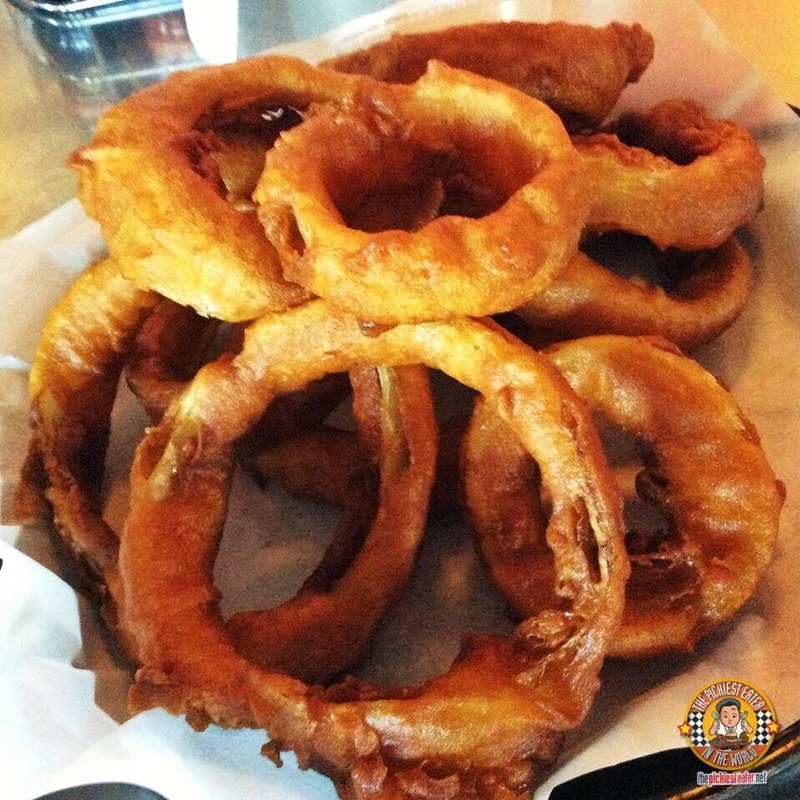 The plump onion rings are dredged in a beautifully seasoned batter, and deep fried to golden perfection. The rings let out a loud crunch with every bite, and reveal a light natural sweetness to the onion. I love me a good pulled pork sandwich, but Adam (through Man V. Food) told me to get the El Toro ($6.95). Southern California is more particular to the Deli Sliced Tri Tip, which comes from the bottom part of the Sirloin, and is a leaner, yet still moist cut. 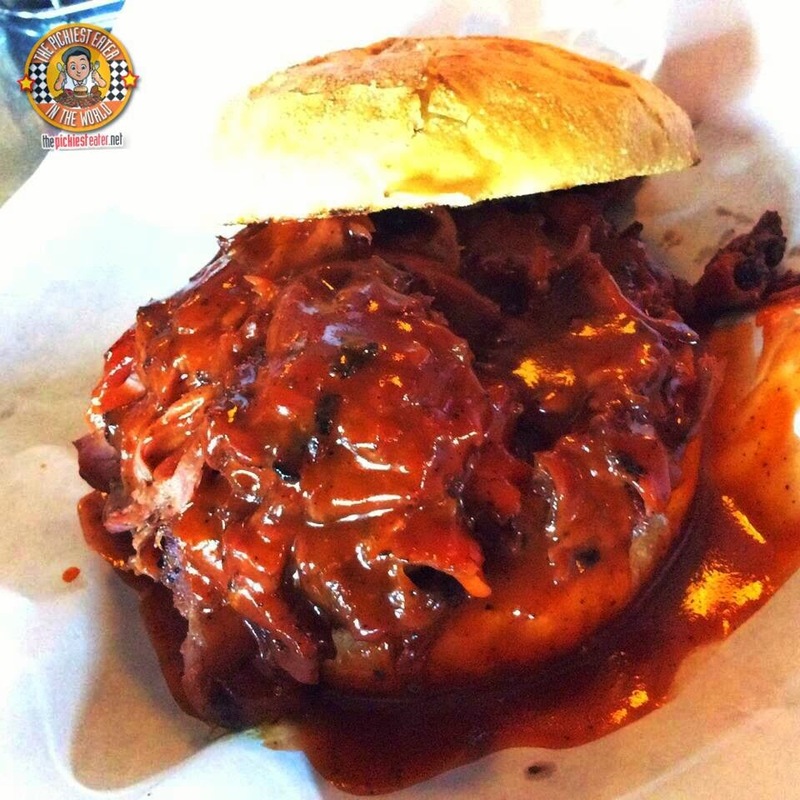 The meat is then chargrilled and drowned in Phil's signature BBQ sauce and served between a soft Kaiser Bun. I'm really not fond of lean meat, but this was just so juicy, you wouldn't notice it was lacking in fat at all, and that BBQ sauce had me licking the wax paper after the sandwich had been demolished.. a sign of things to come. I decided to get the Beefy Rib Dinner (3 bones 15.95/ 5 bones 22.95) with a.. uh.. "Small" side of French Fries and Sweet Baked Beans. 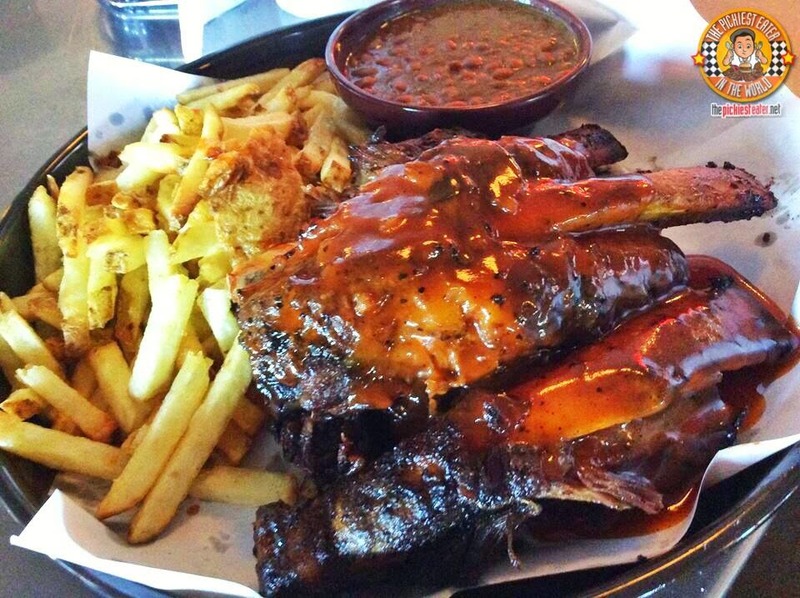 The grilled beef ribs are insanely delicious. The meat is so remarkably tender and is hanging on the bone through the thinnest layer of sinew possible. The Rib was so huge, I felt like I was in an episode of "The Flintstones" when I was eating it with my bare hands. What I liked about it is that it had a bit of fat content, which I noticed isn't very common in American restaurants. For the sides, the french fries were nice and crunchy, whilst the beans had a wonderful touch of smokey and sweet, perfectly complimenting the meat. My parents got the Baby Back Ribs (Half Rib Dinner 6-7 Bones $13.95), which was all sorts of amazing. Like the beef, the pork would tear cleanly off the bone and virtually melts in your mouth with every bite. The beauty of Phil's really lies in its BBQ sauce, which is totally unlike anything I've had before. As the meat is being grilled, it is basted in Phil's signature sauce that owner Phil Pace concocted when he was 15 years old (When I was 15 I could burp the alphabet). As the sauce is licked by the fire, it creates a caramelized crust around the meat, giving it a delicately sweet smokiness. Truly the among the best Ribs you will ever try in your lifetime. The great thing about Phil's is that you can buy Phil's Sauces and Rubs available for sale, so you can attempt to replicate Phil's delicious ribs at the comfort of your own home. Yup, we took home a couple of bottles of sauces and rubs! A special shout out to my boy Alfredo for taking great care of me and my family during our awesome meal at Phil's! (This pic is for all my readers that say I only take pictures with hot waitresses.. Although my buddy Al is a good looking guy in his own right). So this was the first restaurant on my MVF bucket list that I managed to check off! And what made it even more special was that I was reunited with my beautiful niece and future Attorney at Law, Cara aka Crave The World. Expect more from Cara soon, as she is now back in the Philippines and is getting ready to enter the blogging scene! Like Phil's BBQ on Facebook! Adam would be proud of this post. Your comment brought a tear to my eye, Isel.. Sniff..